Today I wanted to show you the sketch I prepared for the 2014 PRAIO Blogger Fashion Contest. I have been asked to take a look at Praio's spring/summer 2015 collection and come up with a piece that I think is missing. 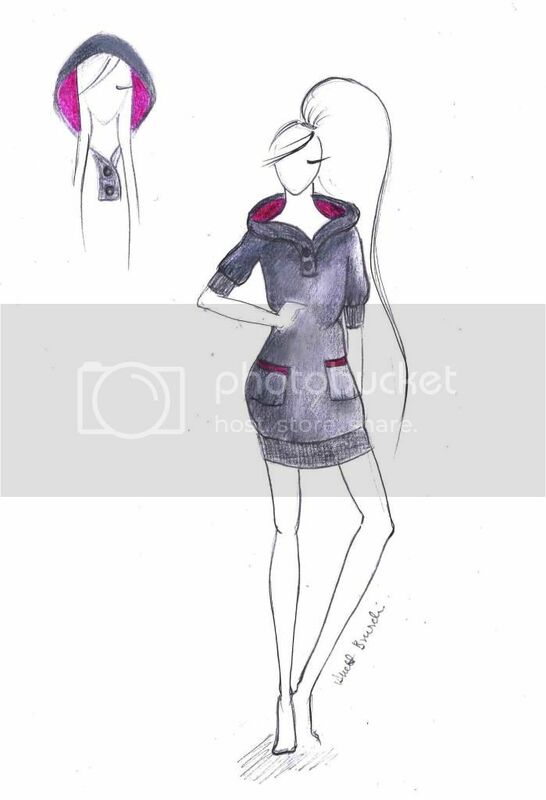 I decided to design this hoodie dress, which will become part of the collection if you help me win the contest by liking my sketch on Instagram. The Praio ss2015 collection is sporty and comfortable, but also elegant and original. The only thing that's missing, in my opinion, is a dress. My design fits into the sporty chic concept of the collection, and I would love to see it made in a soft grey cotton jersey fabric with contrasting fuchsia inserts. You can wear it with a pair of sneakers, biker boots or chunky heeled sandals. What do you think? Oggi volevo mostrarvi il mio bozzetto fatto per il PRAIO Blogger Fashion Contest 2014. Dopo aver visionato il lookbook della collezione primavera/estate 2015 di Praio, ho deciso di disegnare questo comodo abito-felpa che, se mi aiutate a vincere il contest votando il mio bozzetto su Instagram, farà parte della collezione e verrà realizzato. La collezione P/E 2015 rispecchia lo spirito di Praio: e sportiva e comoda, ma allo stesso tempo elegante e originale. L'unica cosa che manca, a mio avviso, è un abito. Il mio design segue la linea sporty chic della collezione: l'ho pensato in un morbido jersey di cotone, grigio con inserti fuchsia a contrasto. Indossatelo con un paio di sneakers, anfibi o dei sandali con tacco grosso. Che ne pensate? Great design, I would definitely like it on Instagram if only I had an account. Sorry, I can't help you in this case..
Solo su Instagram? Non ho un account... FB no? Mi piace molto, io lo indosserei subito!!! Ti aiuto volentieri! è un disegno bellissimo! buona fortuna!! What a cool contest! I love your entry and idea and I think it would be perfect with the collection! Your sketch is really amazing! Wow! You're really talented! I just Liked your photo on Instagram :) Wishing you the best luck!!!! Ho messo un super cuoricino...in bocca al lupo per il contest! mi piace un sacco!! bravissima complimenti!! In bocca al lupo per il concorso! Un'idea davvero azzeccata! Amazing sketch you are very talented. Wonderful sketch, you are really talented. I love the concept, great sketch! Good Luck! Wow... sei davvero brava... è bellissimo! Beautiful design. Your so talented. Molto bello sai questo contest! Beh che tu sia bravissima a dusegnare è cosa nota Anett...Bellissimo bozzetto. ciao bellissima, mi piace molto il modello che hai creato, sportivo e chic allo stesso tempo, bravissima! here you have another supporter! I hope you will make it!